When i first heard that Tony Moly’s current ambassador, JYJ, was going to be replaced with Super Junior M, i was pretty upset. Ya, i’m a fan of Super Junior but with the amount of promotions and concerts they have as compared to JYJ in south east asia, i would prefer JYJ being advertised more by cosmetics. To keep me sane, so to speak. So i went with Serene to go shopping at Tony Moly just for the sake of freebie. 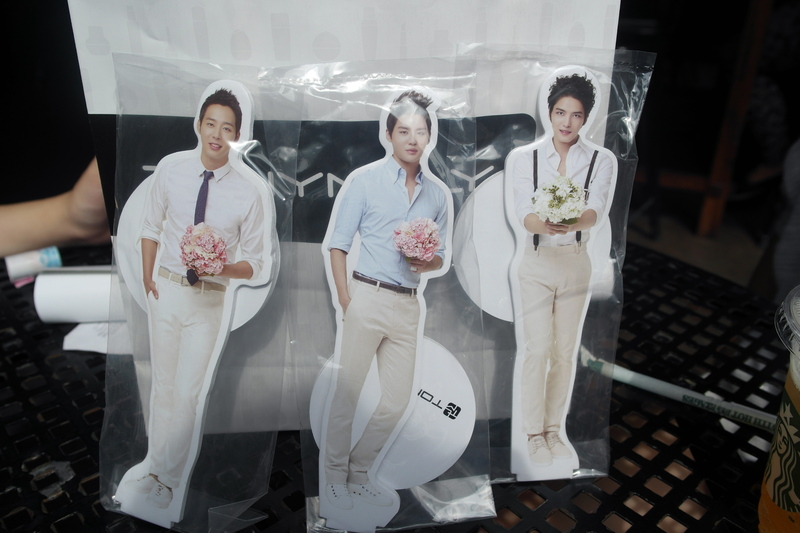 Aren’t these JYJ standee adorable!! I may have found the perfect eyebrow product, but i have only tried it once. Its the Easy Touch Auto Eye Brow pencil. I initially planned to get grey, not brown, as I have previously tried the Lovely eyebrow pencil in brown from Tony Moly which is too red for my eyebrows. Thus tried the lovely eyebrow pencil in grey and found it a perfect match, so thinking that Easy Touch Auto Eye Brow pencil in grey should match me as well. But grey was no longer available. I’ll do a full proper review as though if i truly love it by the end of this month. Next ›Bella Box Singapore’s September 2013 theme: Pink Me Up!